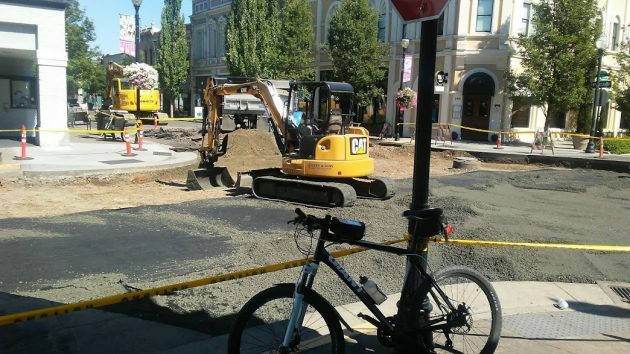 If you’re on a bike (or on foot), construction at First and Broadalbin need not concern you. The intersection of First and Broadalbin has been closed for a few days as Emery & Sons, the contractor on the city’s big streetscape project, has been working to reconstruct it. This is not part of the streetscape job. But during related utility work last year, this corner had to be dug up, deeper than they anticipated when they unearthed an old wooden storm drain. And there’s been a pronounced dip in the pavement ever since. That is now being fixed, at a cost of about $23,000 from the street budget. Will that be the end? Yes and no. Yes as far as the city’s portion of downtown street work is concerned, at least for now. But Ellsworth and Lyon, the downtown couplet of Highway 20, are still due for repaving. That’s an ODOT job, and the word from ODOT, via City Hall, is that it will be done in the fall. This story has been edited from the original to add a couple of details. Here’s hoping ODOT turns it over to Knife River.